This black P200 MKII Compact Light Stand from Phottix has the load capacity of 6.6 lb, is comprised of five sections with four risers, and can be extended to a height of 78.7". It features a removable 1/4"-20 to 3/8"-16 brass lug to attach to most common studio lights. With retractable folding legs, a compact design, and weighing in at 2.4 pounds, this high-grade aluminum light stand is easy to move around the studio or carry on location. 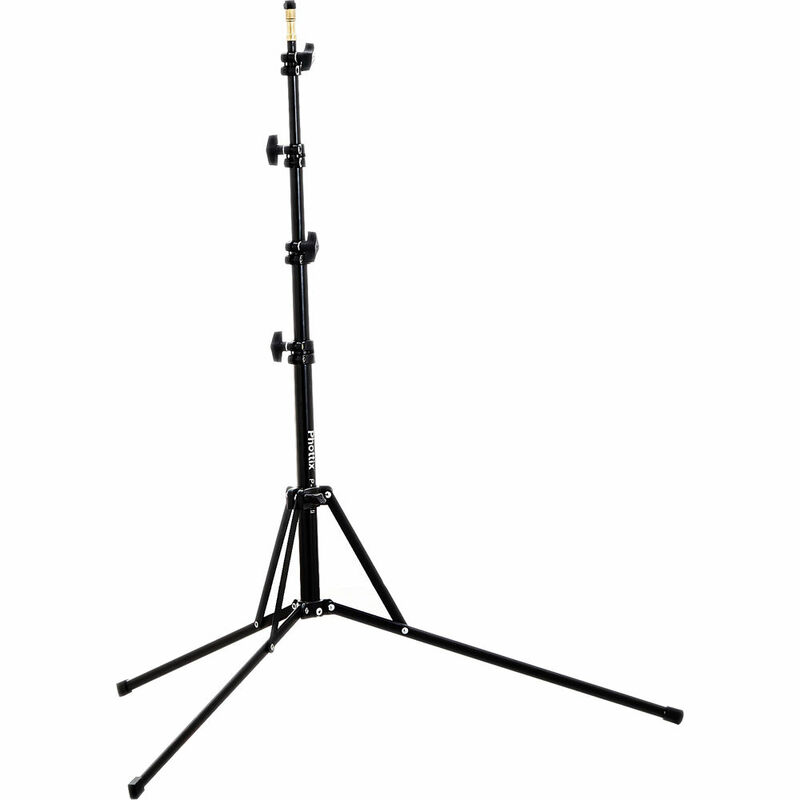 Box Dimensions (LxWxH) 20.3 x 3.3 x 3.2"
P200 MKII Compact Light Stand is rated 5.0 out of 5 by 2. Rated 5 out of 5 by Gregory from Solid Light Stand This is my first light stand and I'm very happy with it. It easily holds a speed light and umbrella, even in windy conditions. One of the black screw knobs fell off mine while in transport, but after quick call to Phottix support they were able to send me a free replacement. Great service and a solid product. Will be buying more of these as I add extra flash units to my kit. I'm looking to use this with an Einstein e640(5.5lbs) and 60 soft box raised just enough so the soft box doesn't touch the ground. Would this suit my needs? I use mine with the Einstein 640 and a 7 foot umbrella and have it a few of inches off the ground and it works great. what is the minimum height? The minimum height is 21 inches. Can this be used with a spyderlite td5? The stand can work but it depends on the specific Spyderlite and softbox you are using. The stand can support up to 6.6 lbs. You should not go over that. And if you use this with a large softbox best is to use a sandbag to prevent it from tipping. This is one option for a sandbag, Impact Empty Saddle Sandbag - 27 lb (Orange Cordura) B&amp;H # IMSBEO27 MFR # SBE-O-27.